Such lovely Earth creatures, the Poppies. Magical in so many ways, with intentions to entrance. Come here my pretty, don’t you want me? Eye see You. Look at this pod, it is filled with seeds. You can plant me or with the right variety, eat me. Wouldn’t you like to see me growing near your home? What type of growing conditions do Poppies enjoy? 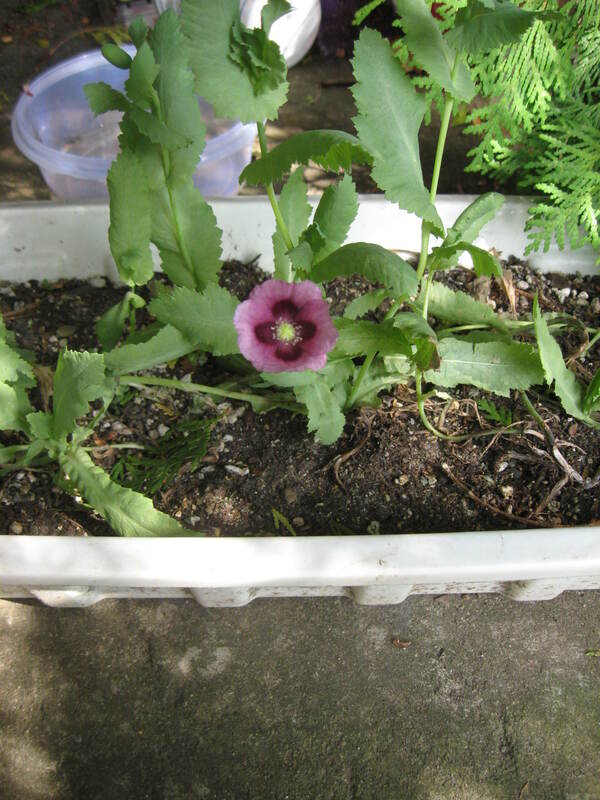 I had heard rumors that Poppies were hard to grow, when my Boyfriend filled our windowbox with the purple Lauren’s Grape on June 1st 2009. Gardener Lauren’s best seeds from her purplest Poppies. 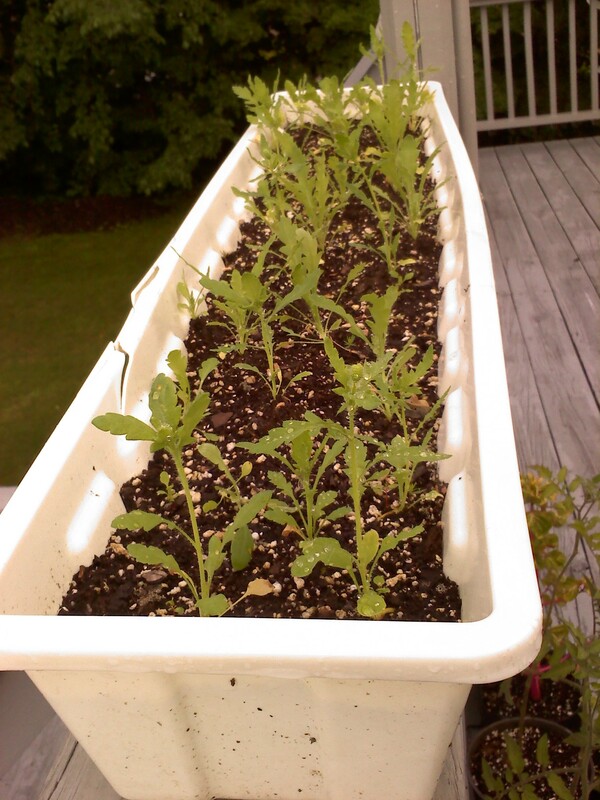 We kept them moist and in 1/2 shade while they germinated, which occurred in 3-5 days! I ended up moving them to 3/4 shade on my front porch once their first true leaves appeared. I did not thin them so they were very crowded in their windowbox. But they bloomed never-the-less, and were stunning little beauties! 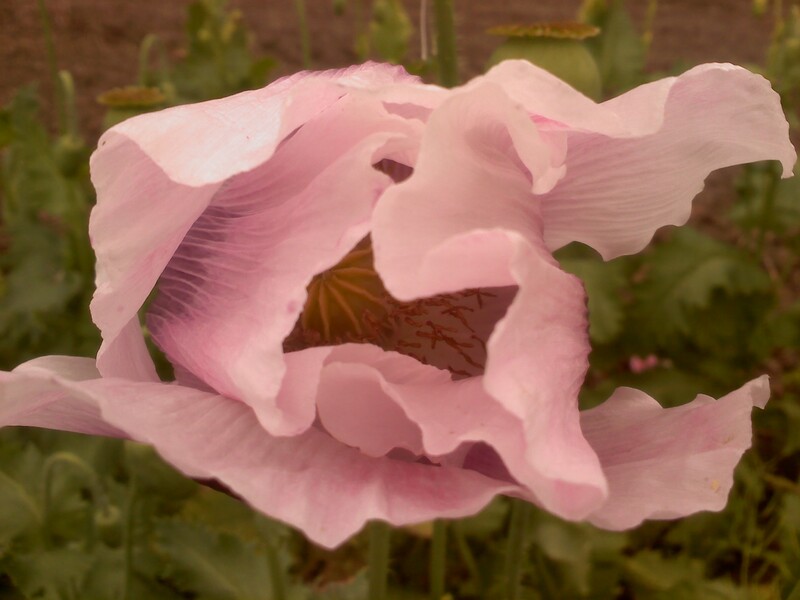 In May of this year my Farmer decided to transplant Poppies from the greenhouse, which he had never done before. I was thrilled to commence the Experimence! The small Sprout’s Agave-like appearance had a long single root from its base. Scraggly and barely holding on to its lower soil-entrenched root mass, I made each one a custom pile of dirt against its base, encouraging them to enjoy their new home in the field – healthy bio-active organic soil, 3/4 full sun, and just enough rain water to keep them happy. Boy, did those Poppies grow! I’d say they enjoyed this location. 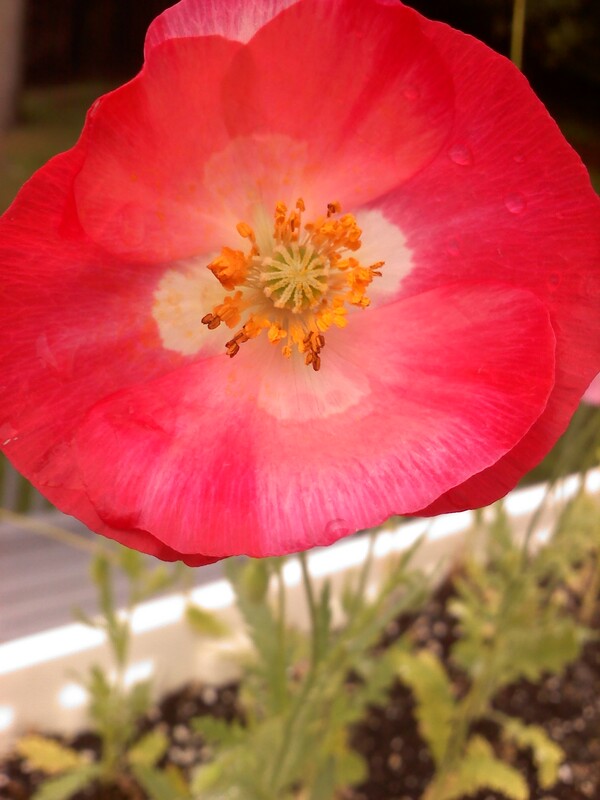 In my tiny yard, and my tiny porch, I could not give the Poppies the same conditions the field had. 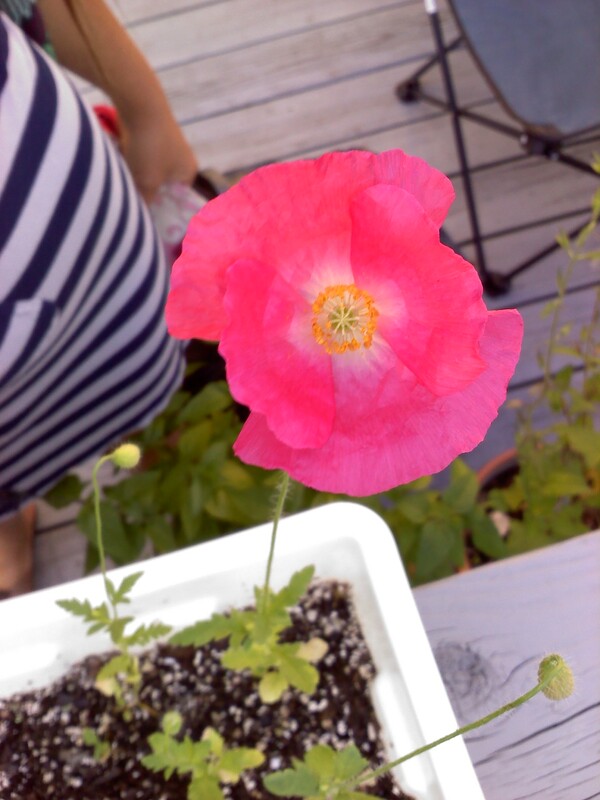 But I do love to have a smiling Poppy face or two around my door, so we once again planted our window box with way too many seeds and had a second summer of ‘Bonsai Poppies’. This was in late May, outdoors. The seeds germinate very well. 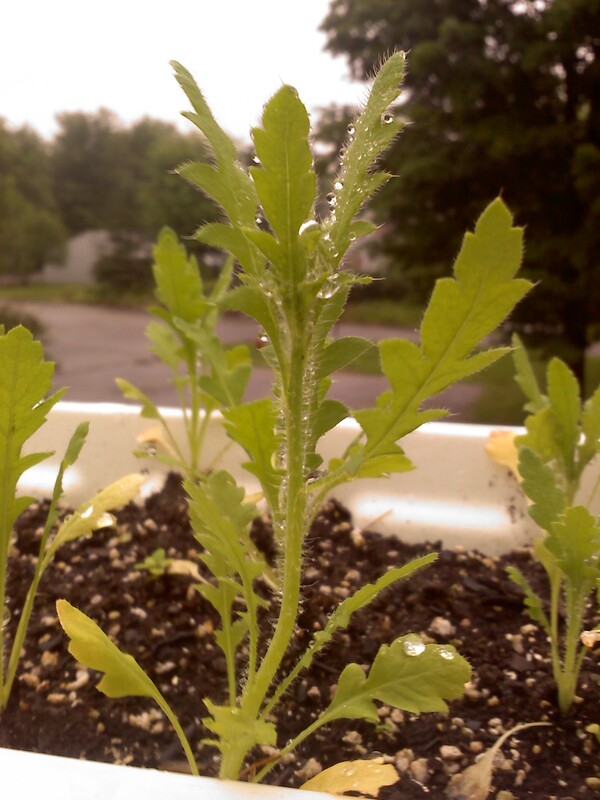 I had bought the seed packet at the end of 2009′s growing season for 25cents at the Dollar Store. I sprinkled it like a spice on top of the soil (Poppy seeds need light to germinate) and then pressed them in lightly with my palm to ensure soil contact for the roots. I kept them in the shade on my North-East facing porch and used a spray-bottle to water them twice a day. After they formed their true leaves I put them in 3/4 sun. I did end up thinning them this year, and I actually gave each mini Poppy its own mini hill. They grew tall and leggy, but each plant had several blooms. And they just kept going, going, going. In fact, they are still blooming outside today. They reached about 2 feet at a maximum height. When do they bloom and for how long? So I thought it had something to do with the amount of daylight. I thought I had always seen them twice a year, like maybe early and late? But now I beg to differ. The Poppies in the field and the Poppies in my windowbox this year both bloomed around the Summer Solstice (June 21st). 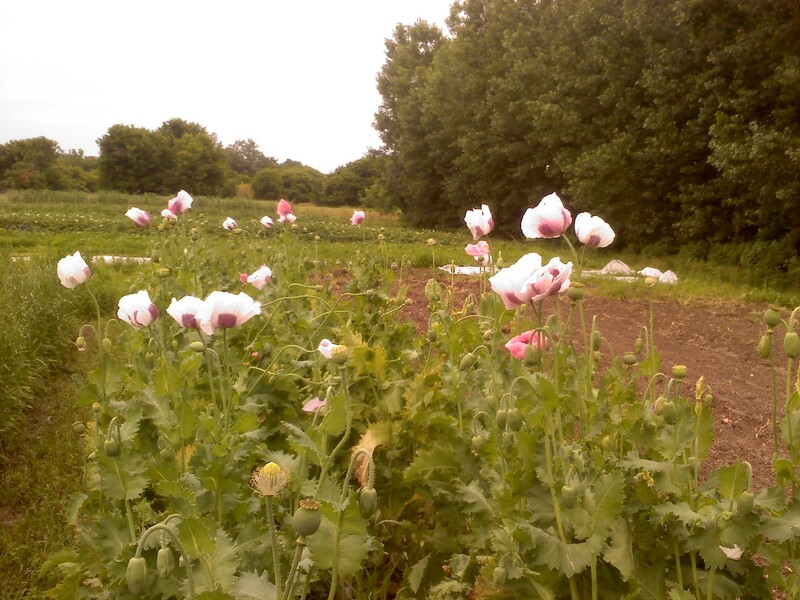 There were also some wild Poppies in the field that bloomed the same time. So I want to say they bloom then, but the first year I planted them they did not bloom until the Autumnal Equinox (September 21st). So from this Experiment, all I can say on blooming is that they prefer to do it on seasonal holidays… aren’t they smart? But I would like to say that they prefer longer days and thus bloom at the Solstice, because the majority did that. Asking around I find that Poppies could potentially start blooming as early as the Spring Equinox (March 21st) depending on the climate. I guess the short answer is to say, bloom time: Jan-Dec. But, I think there’s more to it. I think the Poppies have timed it and they come out on their favorite Earth Holiday. It’s more fun that way. How much fun is it to laugh and lay with the Poppy Spirit? 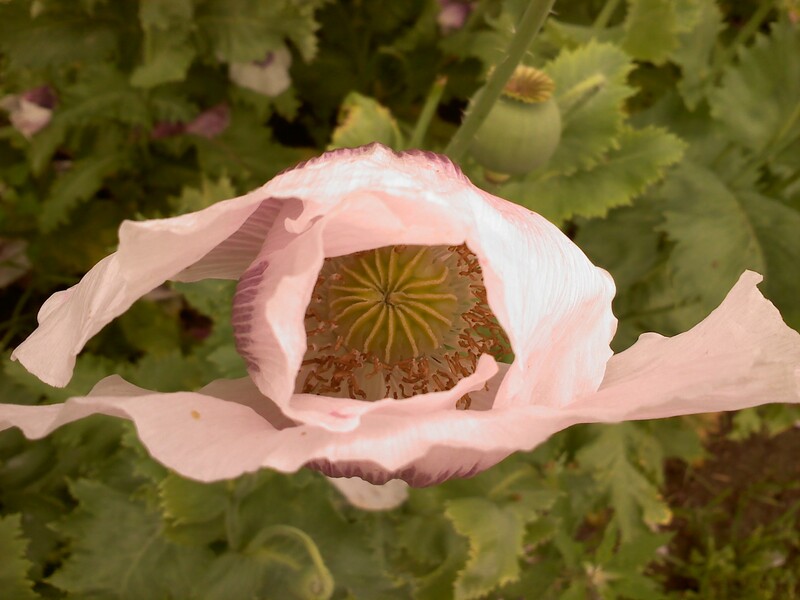 Obviously the Poppy has been made popular by its intoxicating effects (and the complete abuse thereof). 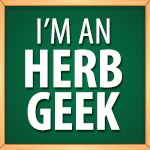 But the goal here is to notice that Plant Spirit Medicine can occur without physically ingesting the plant. 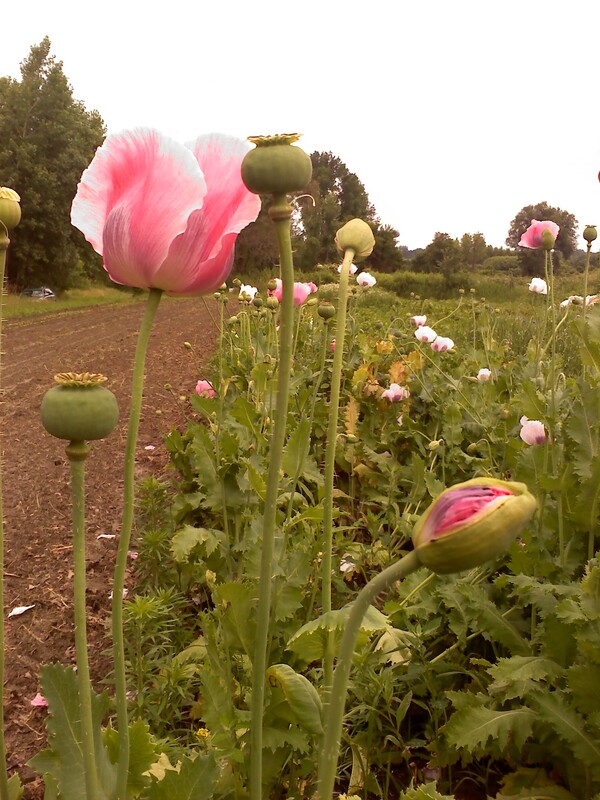 Just being near a Poppy gets you lifted. Especially the large ones in the field. They were lovin life, always wanting to hang out and just breathe. Their Essence was powerful, and they spoke strongly. They made themselves present and lulled everybody in to bliss. Their whispers brought each CSA member to their side. It was always the first in the Flower Patch to get visited. The Poppies on my porch keep me company while I relax in the shade. What else are porches for? And so the Poppies adorn it well. I like to take pictures of them – here are two of my favorites. To try out your own Poppy Experiment, pick up a pack of seeds and sprinkle them in the sunshine. Make sure to keep them moist during germination. Then sit back and smile. I do not recommend or think it necessarily necessary to ingest any form of the Poppy plant. Do poppies grow well in a windowbox? Sombody anybody?